This savory tarte, which uses fresh goat cheese and roatsed Roma tomatoes, is based on a "tarte fine" served at the beach restaurant at Club 55 in St. Tropez. Although their version uses puff pastry and is made in individual tartlets, this version captures the same simplicity, intense flavors and freshness that summer produce brings to our table. It's a very easy tart to make and doesn't require any baking (except for the pastry crust). Though this tarte could be made at any time of year (when Roma tomatoes are available), it's lightness makes it particularly suitable for outdoor Sunday suppers in the summer. Since it can be assembled several hours ahead and served at room temperature, it's a great a dish for summer picnics or poolside parties. Wash the tomatoes. Cut off just enough of the stem end to remove the stem and then cut the tomatoes in half (lengthwise). Place the cut side down on a flat baking sheet lined with parchment paper. Bake in a preheated 450� oven until the skins "pop" up off the flesh (should take about 20 minutes). Remove the baking sheet from the oven. Using tongs, pluck the skins off the flesh, while the tomatoes are still hot. Discard the skins and let the flesh cool on the baking sheet until ready to use. � cup of fresh, mild goat cheese and � cup cr�me fra�che. Mix the two together and incorporate a small clove of mashed garlic. Salt and pepper lightly. Refrigerate until ready to use. In a very deep saucepan, fry 6 fresh basil leaves for a few seconds in � cup olive oil and remove immediately. This must be done quickly because the leaves burn easily. While the leaves are still crispy and hot, put them into mini Cuisinart (or similar small food processor) and blend with the frying oil until the leaves are very finely chopped and almost emulsified into the oil. Salt to taste. When ready to serve, spread a thin layer of the goat cheese mixture over the bottom of the baked (cooled) pastry crust and top with a layer of roasted Roma tomato halves. Decorate with fresh basil leaves, as shown in this picture. 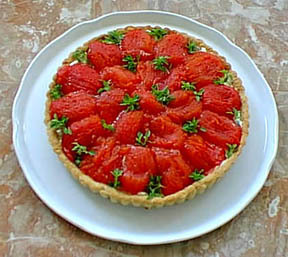 The tarte could be assembled several hours before serving with out serious deterioration of the crust. Just before serving, drizzle the deep-fried basil oil over the tomatoes. Tarte Shell: This recipe was given to me by a friend, Chef Marc Vogel, and I have found it absolutely fool-proof. Roma Tomatoes: This is such a meaty tomato it won't fall apart when roasted. If the tomatoes are hard (and appear to be tasteless) when you buy them, roasting them in this way brings out a surprising amount of flavor. Roasted Roma tomatoes, using this same roasting technique, can be used in many other recipes. Fresh Goat Cheese: Use only a creamy, mild flavored fresh goat cheese. Don't use a dry, crumbly variety. Cr�me Fra�che: If this is not available, you could use sour cream, buttermilk or heavy cream to bring the goat cheese to a spreadable consistency.